First of all, understand clearly. The first step to practicing taijiquan well is that there is a comprehensive knowledge of taijiquan. It is hard to practice taijiquan well if you do not thoroughly understand what taijiquan is. Taijiquan was created by Chen Wang-ting, the 9th generation of Chen family in Chen Village. Chen Wang-ting comprehensively created a set of taijiquan, based on the inherited family wu shu (martial arts), the theory of Yin and Yang, combining Chinese medicine Jing Luo Theory, Tu Na and Dao Yin,. This not only has the quality of Yin and Yang, but also is characterised with activity and looseness, some movement were energetic while others gentle, and some rapid while others slow. As for being in correspondence with human physiology and natural operational rules, it has the functions of fighting, health and amusement and so on, so it is favoured by many Chinese and foreigners. It is guided by a set of perfect theory during the process of practice. 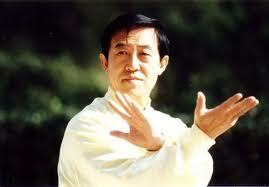 That is to say, taijiquan is a huge projective system. Indeed, it isn’t easy to practice taijiquan well. “Theory” refers to truth & principle. The practice of taijiquan is truly based on principle which is the change of Yin and Yang, the two opposing principles in nature. There is strength as well as grace in taijiquan. The false and true movements will exchange. You shall focus your attention on movements and make your mind lead your Qi then let your Qi move through your whole body. You mentally direct the position of your body and at the same time the Qi will reach there. You need to reach the standard (a level of precision), which is that your whole body moves together, every place of the body follow each other and coordinate internally and externally. When exercising you need to follow the rules, let nature take its course and not be eager to reach results. “Practising energy” refers to strength which is clumsy & stiff and lacks spirit. “Practice the body” refers to practice the entire skills, Forms refers to each movement of attack and defence. Many beginners intend to be interested in the use of each form. It is impossible to master the essence of Taijiquan, if you will explain and understand the methods and the profound meaning of Taijiquan movements. To practice Taijiquan requires a process of being skilled in the routine and the standard actions, and change the stiff into the gentle, which keeps the entire body coordination each other, internal following extend, along with full energy. When fighting you should follow your opponent, and act according to circumstances but not too rigidly adhere to the actions. After you full the Qi in your body, you can react and attack from anywhere of your body because your body is like a balloon full with Qi. The Quan views said that you can naturally defend and attack whatever your opponent attacks. The first ‘heart’ is respect or esteem for ones’ teacher and elders. The well-known taijiquan writer Chen Xin spoke first of the respect in his book ‘Illustrated Explanation of Taijiquan.’ How do you study martial arts if you do not have respect? You must esteem your teacher and elder before you practice Taijiquan. If you haven’t respect you will slight your master and friends and practising Taijiquan will not be good for your body. How do you study martial arts if you can’t eliminate your haughtiness? The second ‘heart’ is ‘confidence’ which includes two aspects. One is self-confidence which is the source of motivation for practising taijiquan. The other is good faith in the way one gets along with people, belief in Taijiquan and trust in your teacher. So you can set your body and mind at rest. The third ‘heart’ is determination. If you make the decision to practice taijiquan, nothing can change you. You will not stop until you practice taijiquan well. The fourth ‘heart’ is perseverance. Perseverance means lasting. To set up perseverance refer to practicing taijiquan unremittingly. You practice taijiquan unremittingly for many years as one day. You can not practice taijiquan sufficiently if you lack perseverance and enterprising spirit and stop after a little knowledge about taijiquan. Chen Fa ke, the 17th generation of Chen family, has practised it thirty times every day for several ten years as one day. His gong fu reached the acme of perfection. His experience is a good example of perseverance. The fifth ‘heart’ is patience. Even if you have the four factors above, it is impossible to practice taijiquan well if you lack patience;. The reasons are as follow: First of all you couldn’t practice taijiquan calmly and patiently if you cannot thoroughly understand it’s requirement that are relaxed, soft and slow. Secondly, you shouldn’t be eager to reach results because it needs a long process to practice taijiquan. Taijiquan requires an absence of impetuosity and impatience. It must be calmly practiced to keep a noble spirit. When conditions are ripe, success will come. 5. Possess the three essential factors. These are masters, talent and training hard. Masters are the chief factor to practice taijiquan well. As the ancients said, “teachers mainly teach and explain the rules of the course for their students.” It is unlikely that you will reach a high level without the teachers’ help whatever you practice martial arts and characters. Of course, it is not true if you practice taijiquan for amusement. You need masters that understand, with noble character, perfect skills and teaching methods if you want to practice taijiquan well. The good master will guide you to the standard (precise) actions and lead you to reach the goal quickly. You will go astray and cannot enter the Taiji hall if you have do not get correct directions. Talent is another of the key factors for practising taijiquan. The practitioners who specially want to make great achievement in taijiquan must be intelligent, have strong acceptance, have logical thought processes, quick reactions and can draw inferences about other cases from one instance. When you practice the path of taijiquan you need not only the a direction of good master but also personal experience which you must ponder it in your mind. What is said “can be sensed, but not explained in words” is not conservative but it can not explained. You will realise the rules of taijiquan, then attain the high boundary only if you have good talent and power of understanding with the other requisite factors. Otherwise you will only reach the low-level because you couldn’t realise the quintessence of Taijiquan. Training hard is the other decisive factor of practising Taijiquan. If you want to reach the highest boundary of Taijiquan you must study and train hard although you are intelligent and get the correct direction of good masters. The Theory of Quan said “you thoroughly understand the theory, train hard and make progress day by day, then you will reach the highest state of Taijiquan with the passing of time.” During the course there are no quick accomplishments or short-cuts to take, only ‘train hard’. Gong fu need constant hard practice. Under a good masters’ correct direction, you follow the rules, with unremitting practice and so breed internal gong fu in your body. The power of understanding is only produced from training hard. This way you can seize the understanding and savour the true meaning of Taijiquan. If you are responsible for your own intelligence and not willing to train hard you can not understand the quintessence and will only be waved out of the hall of Taiji. Those are a few of my views that influence and promote each other but not to change thoroughly. It may speed and promote to build the five hearts if you will understand clearly and correctly. You can realise the essence of taijiquan through the constant practice as some practitioners have the poor talent. I will be happy if these comments help you to practice Taijiquan better.